The human digestive tract contains a complex and diverse ecosystem of trillions of microorganisms, mainly bacteria. Recent advances in molecular and analytical techniques have permitted identification of bacterial species and strains that inhabit the gastrointestinal tract, their metabolic activity, and interactions with the human host. These studies have provided greater insight into the role of gut microbes and their metabolites in health and disease. Following a $3bn investment in the Human Genome project, the Genome Bioinformatics Group at the University of California completed the first draft of human genome in 2003. This was widely heralded as a breakthrough event in understanding the treatment of a wide range of diseases, but to date is yet to deliver the expected transformation. The human microbiome Project was launched in 2008, and with an initial budget of $115m, the first results were published in 2012. The importance of the role of the microbiome and the understanding of the interaction between human and bacterial cells is increasingly rapidly. The human microbiome is made up of more than 100 trillion bacteria, fungi and viruses. OptiBiotix Health is developing a range of technologies, which modulate the human microbiome to prevent and manage human disease. A global market of strategic interest to pharmaceutical, food, health, and wellbeing companies, the human microbiome is forecast to become one of the world’s fastest growth areas. 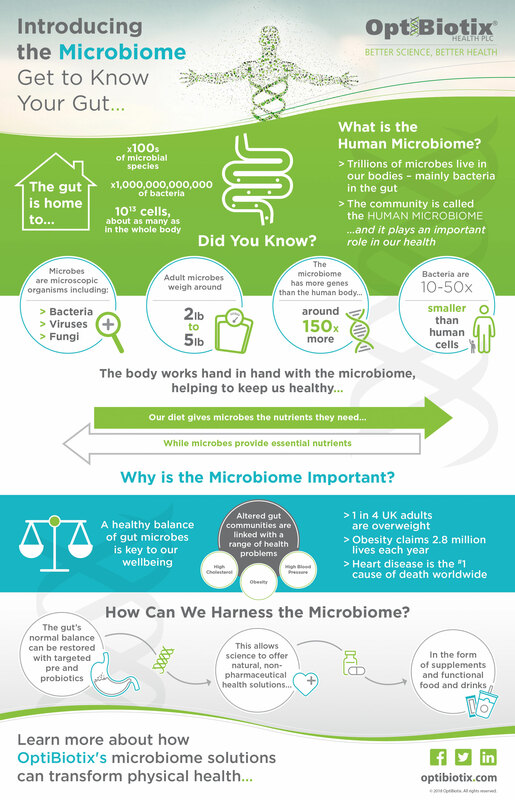 There is a continuing increase in awareness and understanding of the microbiome from consumers, government and media. This has led to growth forecasts for the human microbiome products market of a CAGR of 22.3% (Markets and Markets) with commentators describing the opportunities open to microbiome development companies as being in the region of a trillion dollars. OptiBiotix products are designed to improve consumer health and wellbeing and support the prevention and management of chronic lifestyle disorders (hypercholesterolemia, obesity and diabetes). These markets have enormous potential driven by macro environmental factors, including an ageing population, rising medical costs, a public health policy shift towards disease prevention and consumer trends towards healthier lifestyles, better nutrition and self help. OptiBiotix is at the leading edge of this evolving field and with its validated technology platforms is well positioned to exploit increasing public, political and investor interest in this field. OptiBiotix has developed an extensive Intellectual Property (IP) portfolio composed of patents, trademarks and strain deposits. These create a broad and overlapping portfolio of IP, which protects its commercial interests across the world and limits potential competitors from entering the field. OptiBiotix® has a broad portfolio of over 65+ patents across 17 patent families. These are a mixture of formulation and application patents, which are continually being updated to extend protection as new application opportunities are identified. OptiBiotix has over 28+ trademarks that help distinguish its products from competitors and allow sit to build and protect a recognisable brand. OptiBiotix has deposited eight unique microbial strains in accordance with the Budapest Treaty of 1977 at the International Depositary Authority (National Collection of Type Cultures, Porton Down) within the European Collection of General Cultures. OptiBiotix has built upon its research and development foundation to establish its commercial business, generating high market interest and early revenues with product launches. This new phase of the company’s development is maturing a growing pipeline of products designed to combat a host of chronic lifestyle diseases, making the benefits of human microbiome modulation commercially available. These products and their attendant revenue streams, supply agreements and royalties, enhanced by growing industry interest, are significantly advancing OptiBiotix’s company value. Its commercial interest is protected by an expanding portfolio of over 65 patents and 26 trademarks, with commercial partners in place for all platforms across global brands. OptiBiotix Health has developed three main screening programmes to identify and develop technologies to modulate the activity of the human microbiome. These technology platforms create multiple product and partnering opportunities both within each platform and by combining platforms. For example, by combining sugars produced on one platform with microbes identified in the other, OptiBiotix can create new product concepts. This unique approach provides significant opportunities for growth and a cost effective way to exploit the potential of the microbiome. A high throughput technology platform that screens identifies and/or develops microbiome modulators, which can be used in proprietary formulations to prevent, manage, and a wide range of chronic lifestyle diseases. III. PsychoBiome is under development. Designed to improve cognitive health and reduce anxiety and stress related conditions. A high throughput pharmaceutical screening platform to identify microbial metabolic pathways that interact with human pathways to improve health. 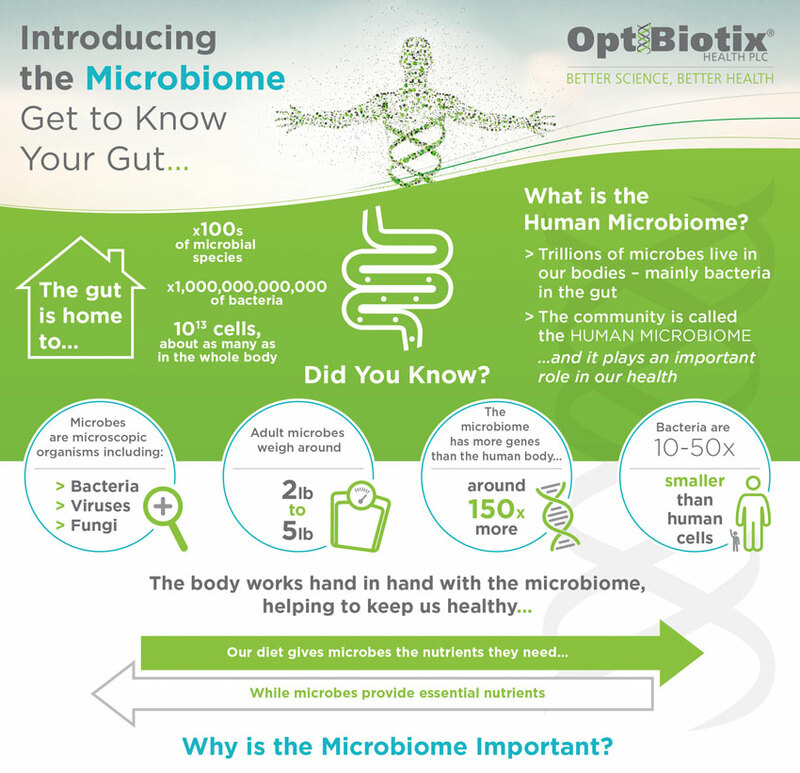 OptiBiotix Health has developed a proprietary high throughput screening and optimisation technology platform designed to identify microbes with metabolic pathways that can interact with human physiological processes and derive health benefits. The platform identifies target microbes with biological activities that can mediate specific health benefits (e.g. cholesterol reduction). Phylogenetically distinct strains of target bacteria are then selected and screened for their biological activity, identifying the best targets for development. The first application of the OptiScreen® platform has been in cholesterol reduction. Following initial work to identify a target mechanism, a successful human intervention study was completed in 2016 working with the University of Reading in the UK, globally recognised as leaders in this field. The study published in 2017 showed clinically significant reductions in Total Cholesterol of up to 36%, LDL cholesterol by up to 13%, and the ability to lower systolic blood pressure by 5.1%. The independent study concluded ‘The results of this study provide early evidence that Lactobacillus plantarum ECGC 13110402 has potential as a safe, easy to use, cholesterol reducing supplement, to lower blood LDL-cholesterol in mildly hypercholesterolaemic subjects’. A high throughput screening platform, which generates oligosaccharides and screens them for their ability to modulate specific microbial genera or species and their microbial end products (short chain fatty acids such as acetate, propionate, butyrate) and physical properties (sweetness). This process results in ‘designer prebiotics’ specific for a microbial target (genus/species) associated with a health benefit and has the ability to be used individually to modulate the microbiome or in combination with a probiotic to enhance the health benefit. This is a new product concept that allows the creation of targeted microbiome modulators that increase the growth, biological activity and health benefit of individual genera or species in the human microbiome. OptiBiotics®: Designer oligosaccharides (prebiotics) for a specific microbial target associated with a health benefit. They can be used in combination with the target microbe to selectively enhance its growth and activity and accentuate its functional properties and health benefits. Microbiome Modulators: Targeted prebiotics that target health positive bacteria in the gut to stimulate the production of bioactive metabolites, short chain fatty acids (SCFA), such as propionate and butyrate. SweetBiotix® – calorie free, sweet natural healthy fibres, with gut microbiome modulation activity. The OptiBiotic® concept has been demonstrated in multiple bacterial strains to date and is of interest to manufacturers and suppliers of probiotics, a market predicted to be worth $46.5bn by 2020. Further development is taking place applying the concept to bacterial genera and species, which generate metabolites of interest such as propionate, butyrate and acetate. These may have benefits in the prevention and management of obesity, diabetes and immune health.